A friend of mine, and her husband, were on vacation. They visited a church on Sunday. My friend likes to sit close to the front. So they entered a pew in the second row. 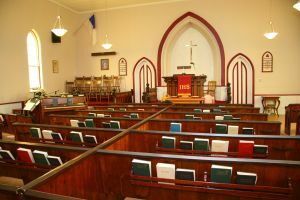 Shortly after settling into the pew, an usher came up to them, tapped lightly on bench, and said, "This pew is saved." Her husband replied, "So are WE!"